In shallow dish, place dressing. In another shallow dish, mix bread crumbs, cornbread mix, paprika and pepper. 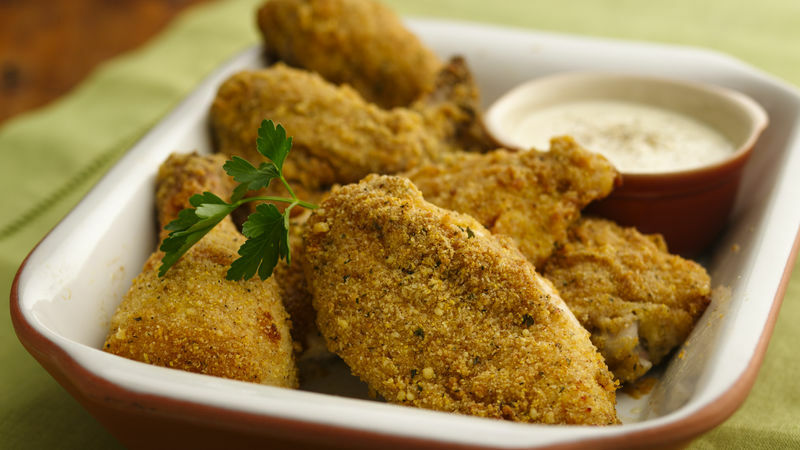 Coat chicken pieces with dressing, then dip in crumb mixture, turning to coat completely. Shake off excess. Place chicken pieces, bone side down, in pan. Lightly spray top of chicken with cooking spray. Bake 30 to 35 minutes or until juice of chicken is clear when thickest piece is cut to bone (170°F for breasts; 180°F for thighs and drumsticks).